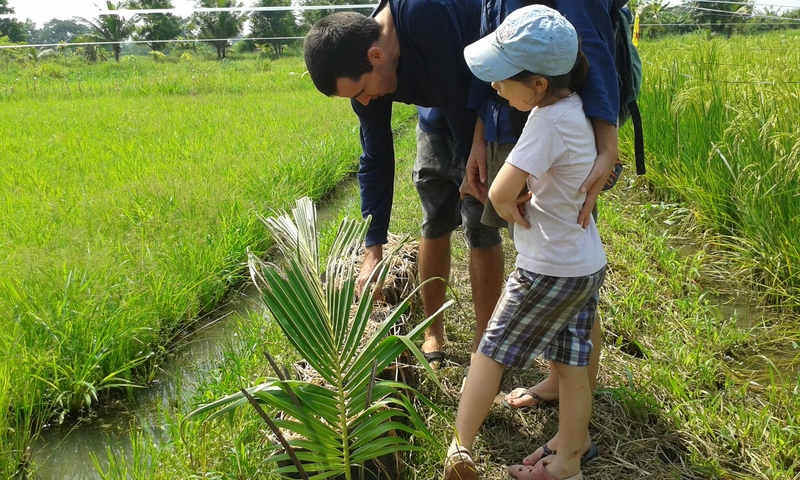 I’ve been in Maesot researching at the Charis Teaching Farm for the past three months now. This post gives a small update on projects we have in the works. 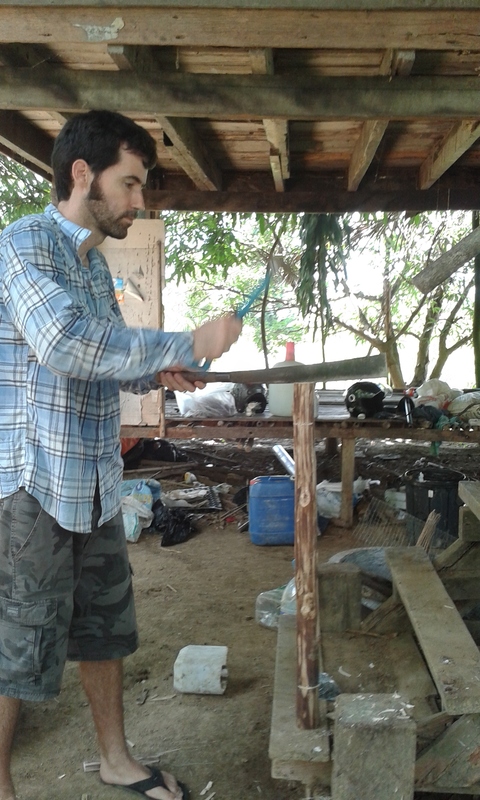 Yes, that’s me using a machete! It’s basically the only way we cut and shape wood. Black Soldier Fly larvae are an amazing nutrition source for livestock. They are about 45% protein! and a sizeable amount of fat and carbs as well. This is perfect food for chickens, pigs and fish. Our children’s home at Doi Muser has chicken and fish currently and are planning to start raising pigs. This project, assuming we do it right, will make their livestock program successful and help to fund some of the overhead for the Children’s Home. In the picture, you can see me shaping some eucalyptus wood for the base for the farm. The farm itself is a 55 gallon oil drum that has been modified to hold leftover food waste (see right). 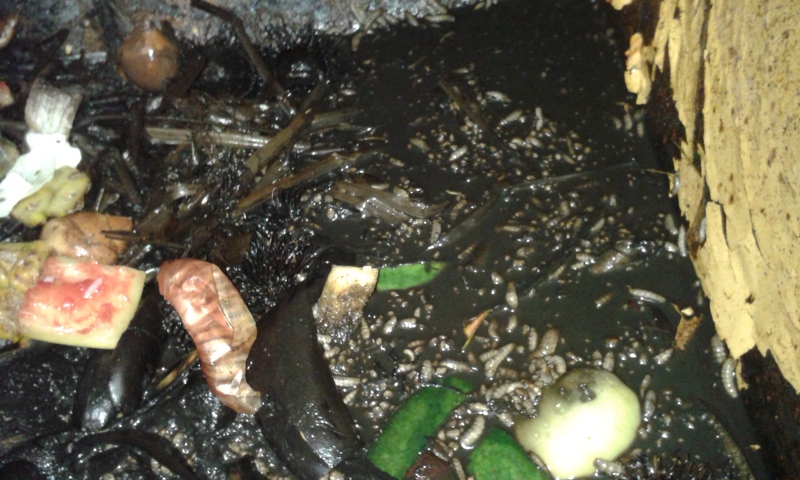 The way it works is simple: fill it with garbage, wait for BSF larvae to come, drain the drum of excess “tea” (a ready-made fertilizer) and place a ramp for the larvae to climb up and drop into a bucket. At this point, they are ready to serve to your livestock. There are some very… lively videos of BSF larvae eating hamburgers and other food online (warning: not meant for the squeamish). 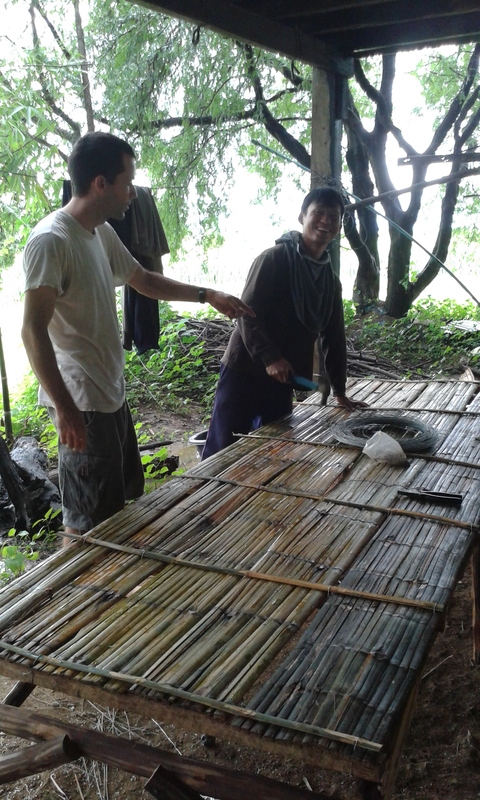 Sak Chai, our farm manager, and myself discussing next steps for the nursery. This is one of the finished tables. During the rainy season our farm’s soil is difficult to plant in in the paddies. While we wait for the next two months to pass and soil to dry, we have begun work on a nursery that we will use to start our seeds. We have just finished work on the tables and only need to place them in the fields and cover them with plastic. We are very excited about all the growth potential this will have for our farm. The future plans for these crops are three-fold: seed acquisition, food-donation to the pregnant women our community outreach program is supporting and selling in the market as a means to promote organic food production and to support our programs. The first crop to be planted will be long bush beans; very tasty. Thrashing the Sunn Hemp for seed. This crop is super legume. Most legumes (peas and beans) are nitrogen-fixing, meaning they pull nitrogen pull atmospheric nitrogen from the air and later release it into the soil. This legume, Sunn Hemp, also fixes phosphate, potassium and other elements. We plan to plant many of the fields with this crop during winter when the fields dry dries. This will enrich the soil. We will also use the stalks for composting, something that will be used for our worm bins and nursery projects. The cutest worm harvesters ever. It was bring your family to work day! 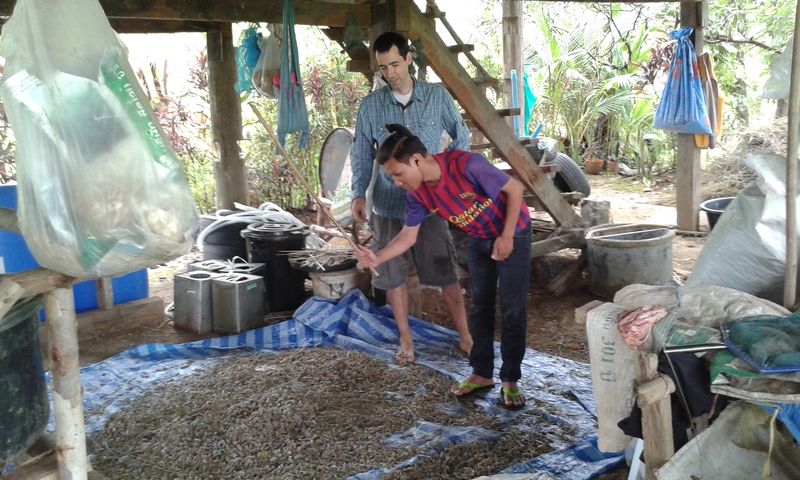 There are only a few farms we know of that use worms in Maesot at this point. This means that we have a huge leg up on the the market. 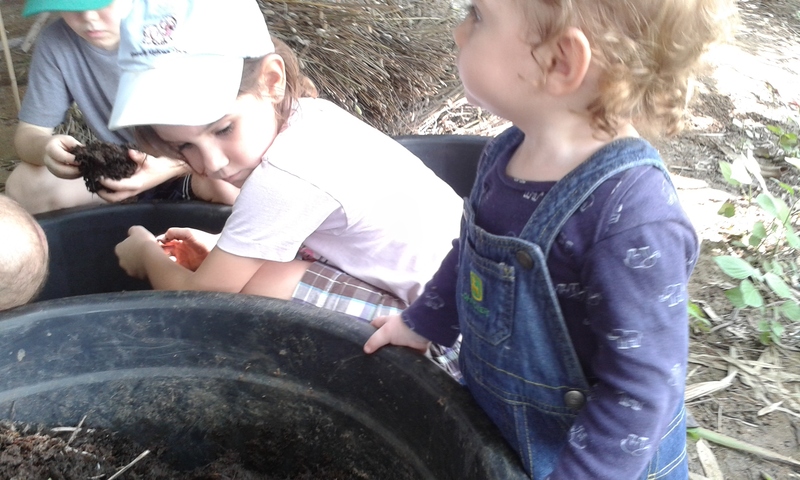 At this point, we have 17 large bins of earthworms turning our compost into worm castings. Worm castings are like farmer’s gold: completely decomposed organic matter, ripe for any plant to grow in. My current marketing plan is to double our production to around 36 buckets. Once this happens, we will begin to sell both the castings and the worms to other farms, while keeping what we need to continue production. This project alone has the potential to subsidize our farm’s monthly expenditures or at the least fund a couple laborers each work, both core goals of the farm. Inspecting the carrots we planted last week. Radish sprouts. The started out well. I just hope they don’t all get eaten before they give us seed. I found in my research is that radishes make an excellent companion crop for carrots. Radishes are about a 5-6 week crop while carrots take 4 months. 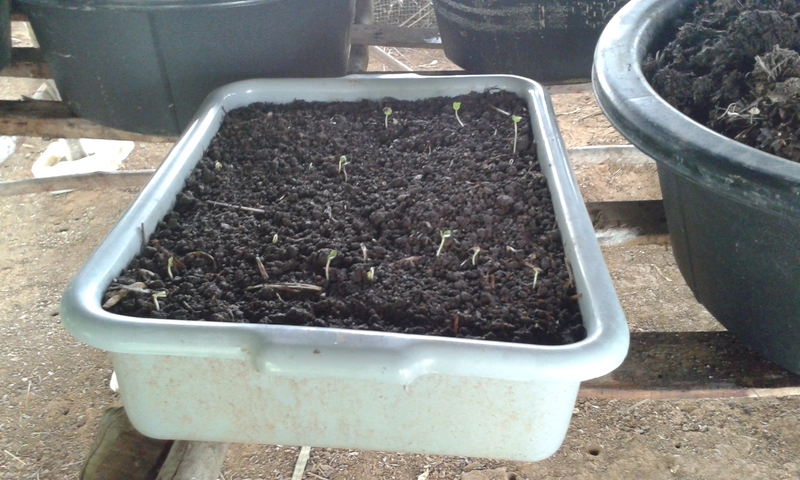 The radishes serve to block the sun for the carrots keeping the soil moist so that the carrot seed can properly germinate. Then, by the time the carrots start needing space to grow, it’s time to harvest the radishes. I’m excited to see our results. I hope you enjoyed this update. I figure most of our readers have been wanting to see what we’ve been doing. I’m considering doing a monthly update with pictures. Would anyone be interested in reading this? If so, click like at the bottom of the post and don’t forget to leave a comment. I’m looking forward to some more recipes from Old McFarmer! You’re in luck, we have a few we’ve been meaning to add to the site. Yes, Please update this every month. It is fascinating.